Somehow, despite Ash and I being together for nearly six years and married for almost four, I’d never really cooked for my in-laws properly before. The odd cake or cookies here or there, but never a proper sit-down meal. I finally got the opportunity to do so this weekend, and wanted to make sure it was good enough to make up for years of insufficient hospitality (I’m Greek. they’re Jewish; food is love). I had a side of salmon – skinless and boneless – weighing in at almost 2kg in the fridge, and had thoughts about poaching it, and lemons and working fennel in somewhere. Then I considered baking and did some Googling. 1 x side of salmon (would also work with the whole salmon). Preheat the oven to around 170 (fan assisted) or equivalent. 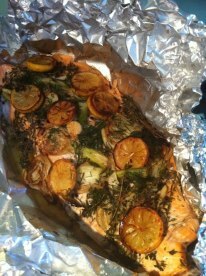 I laid the salmon in a roasting tin lined with foil, and seasoned it with a little salt and the peppercorns. I put a generous glug of olive oil in a deep frying pan and added the fennel and garlic when hot, frying until they were nicely browned. You have to be a little patient, but also watchful, as it turns rather quickly (I had to fish the garlic cloves out first). I then added the lemons, but you do have to be really careful here, as hot oil and watery lemons make for a spitting pan. The lemons need just a minute or so on each side to brown beautifully. I placed the fennel, garlic and lemons on top of the salmon, then added a generous handful of chopped dill with the fennel fronds, and threw over a generous bundle of lemon thyme twigs. A slosh of oil completes the topping, and then the package can be closed up into a foil tent, which doesn’t really have any gaps but does allow a moderate amount of height for steam to develop inside. The salmon baked for 30-35 minutes; it helps to let it sit for a while after and, in fact, can be served at any temperature – so is an excellent make-in-advance recipe to have up your sleeve. Although it means a little faffing at the beginning, and probably some splattery oil mess, it’s also very, very easy for such impressive-looking results. The frying-then-baking takes some of the acrid intensity away from the fennel, but leaves a beautiful aniseed aroma, so that Ash, who is no great fan of raw fennel – or, indeed, aniseed – hoovered it up. Even Ramona enthusiastically chewed on a lemon slice, as it becomes densely chewy and more-ish, despite retaining plenty of lip-curling acidity. I served it with simple sides – new potatoes, carrots, peas and beans – since salmon is so rich and oily, but it’s meaty enough to stand up to more indulgent treatment if you want to push the boat out.